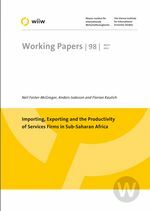 In this paper we examine productivity differences between trading and non-trading firms in the services sector using recently collected data on a sample of 19 sub-Saharan African firms. A variety of parametric and non-parametric tests are implemented in order to examine whether exporters, importers and two-way traders perform better than non-traders, and whether there are differences in performance between different types of trading firms. Our results indicate that services firms that are engaged in international trade perform significantly better than those firms that trade on the domestic market only. Two-way traders and exporters only are found to perform better than importers only, with no significant difference in performance found between two-way traders and exporters only. We further present evidence indicating that there is no significant difference in performance between export starters and export continuers, a result consistent with the self-selection hypothesis for African services firms.